Here is an ad from Valvoline that features the 1971 2.5 Trans Am Championship winning BRE Datsun 510. It must have run in late 1971 or early 1972. Here is an ad for Revell that says you can win a Datsun 510 Trans Am style sedan. It appeared in the February 1972 edition of Car Craft. Here is an ad for the 1973 Datsun 510 featuring the 1972 2.5 Trans Am Championship winning car of John Morton. As you can see the ad ran in the December 1972 edition of Hot Rod and it mentions winning the championship two years in a row. Here is another ad for the 1973 Datsun 510 featuring the 1972 2.5 Trans Am Championship winning car of John Morton. Since it also mentions the fact that they won the 1971 and 1972 2.5 Trans Am championships the ad must have appeared in late 1972 like the previous ad. Jon, cool ad. I see that your file for it is named "Oct 12 1968." Is this the date of the newspaper or magazine that this ad appeared in? What publication was it? The reason I ask is that the Z28 pictured in the ad has the "Super Scoop" ZL2 hood on it. Correct me if I'm wrong, but I thought that this option was introduced sometime in December 1968, first for the COPO cars and then for the SS and Z28? If the date of the ad is correct then they must have used a picture of a 1969 Camaro Z28 wearing a pre-production ZL2 hood. Interesting that they would have teased something like this a full 3 months before it was introduced for production. Scott, the date of the photo is correct and taken from the issue of Competition Press & Autoweek that it was found in. The first appearance of the cowl induction hood was on the 1 of 1 '68 Z/28 convertible owned by Chevrolet's Pete Estes. That hood was probably put on the car by the GM Tech Center and not as a production line component but it was present on the car when it paced the '68 Can-Am race at Road America. The second application of the cowl hood that I have seen is on the car shown in the Berger ad. This was a car used by Chevrolet for its new car introductions for '69 and it appeared in a large number of road tests in the fall of '68 as well as some print ads. 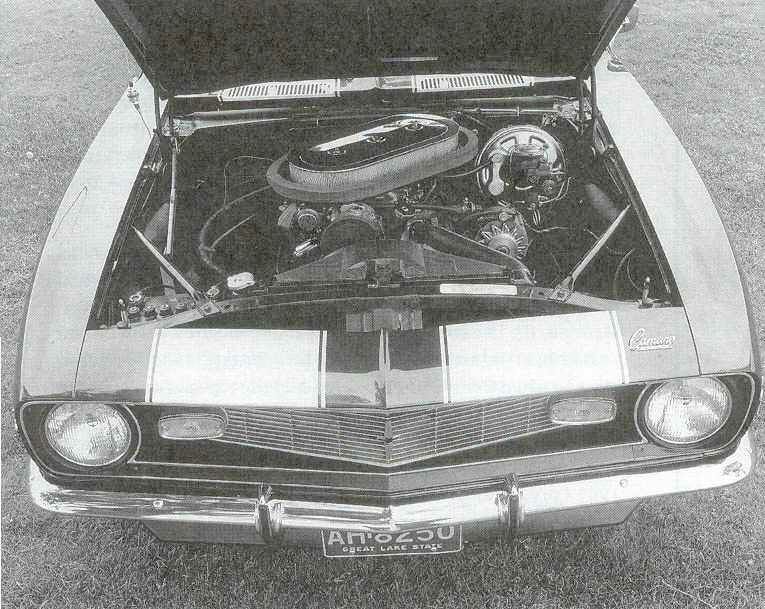 You are correct that the first use of the cowl induction hood as a production line component was at the end of December '68 when they made their debut on the ZL-1 Camaros. Actually, before I get beat up too bad, the correct terminology for that hood is the ZL-2 hood or Super Scoop hood. The cowl induction name did not appear until it was first used on the 1970 Chevelle Super Sports. Scott, that is a GM photo taken at the Tech Center, I believe. I have another one with the hood up which I'll have to post later. I think I may have a color one of the car on the track as well. It came from ebay. 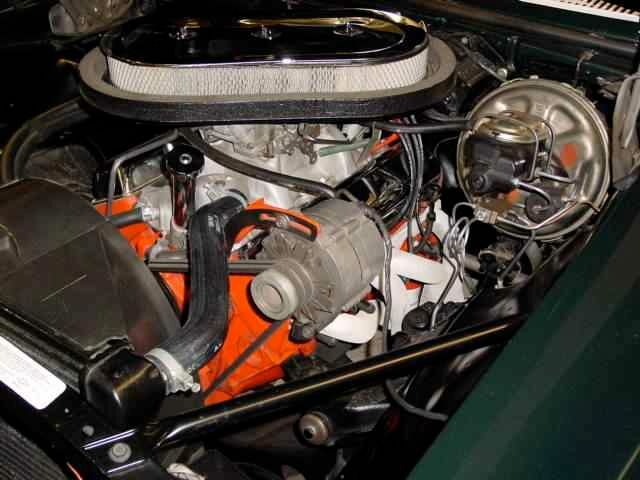 Here's the picture of the engine compartment from 1968 showing a 1x4 manifold/carb with a 2x4 air cleaner set-up. Here's a shot of the engine compartment as of a couple of years ago. Denis Hulme and Sterling Moss rode in the back of the Estes Z/28 convertible after Hulme won the Road America Can-Am race, Sept 1, 1968. 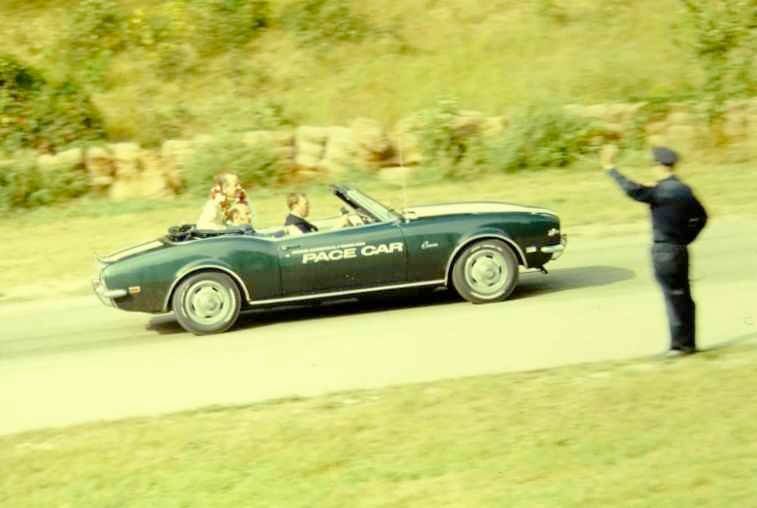 Jon, that is a fantastic color photo of the car during the victory lap at Road America. I remember you mentioning that you attended several races there when you were a kid. Were you at this race? Did you or a family member take this picture? If so, what part of the track was it? To me it kind of looks like the area between Canada Corner and the old bridge leading into the paddock, known as Thunder Valley. Would you mind if I include it in my thread over at the Camaro Pace Car web site that I mentioned in an earlier post? These are the kinds of pictures I have been searching for and I know there are others who would love to see it. Thanks! Scott, I didn't start going to Road America until 1970 so I didn't take that color photo of the Camaro pace car. I saw the photo on ebay and honestly, I don't remember who the seller was or even if I won the auction or not. I know it was a slide and I have won lots of slides. Right now, I don't have the time to go through them all to see if I physically have it or not. If you want to post it elsewhere, I'm OK with that. Thanks Jon. What a fantastic Ebay find! What is that alternator pulley in the color pic?